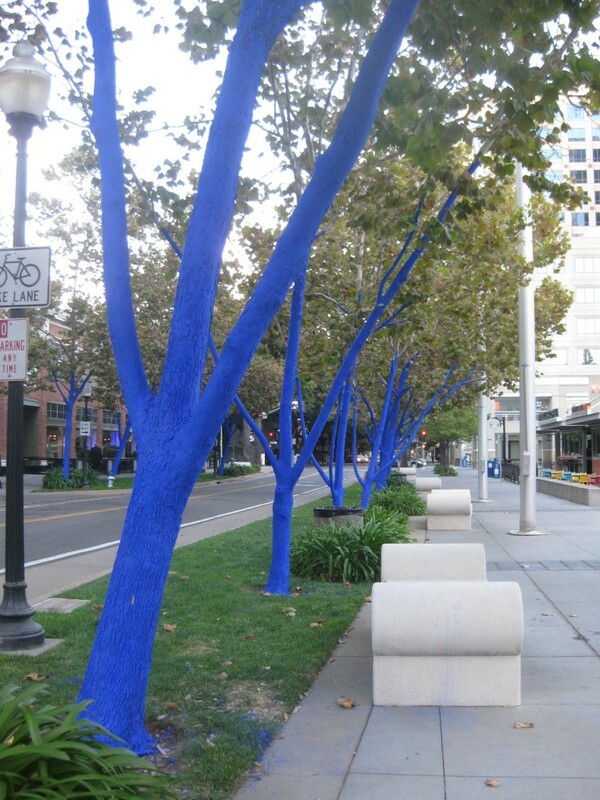 Last week, Sacramento, the City of Trees, became the fifth ‘Blue Trees City’ following the lead of Melbourne, Vancouver, Auckland and Seattle. 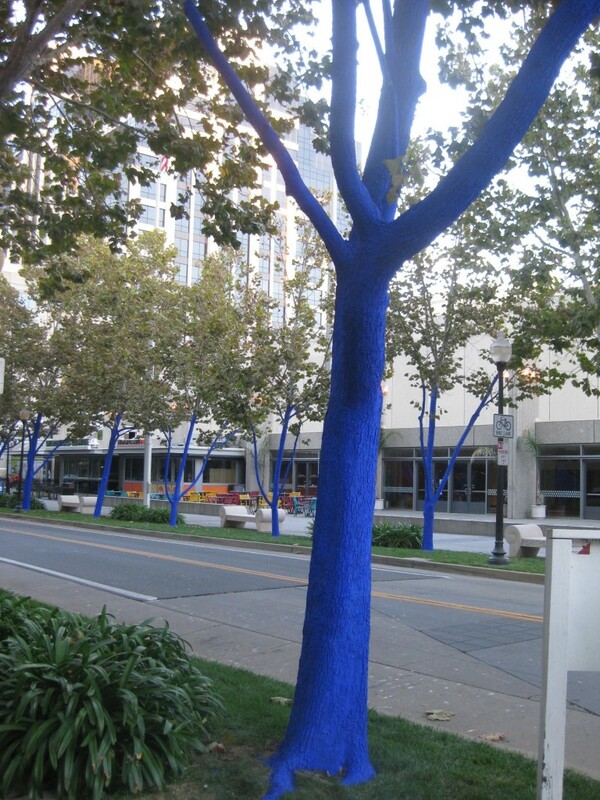 Artist Konstantin Dimopoulos’ created the Blue Trees Project to call attention to global deforestation, particularly of old growth trees (1). 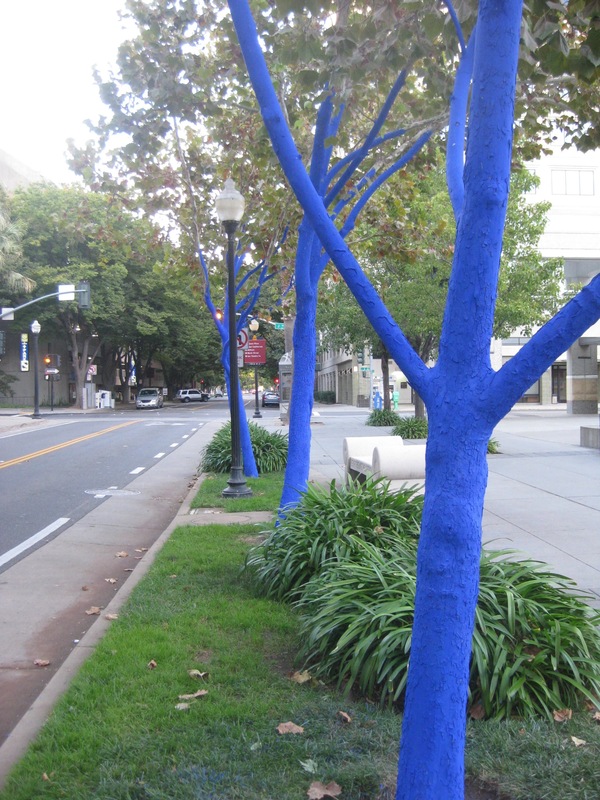 Locally, this living outdoor art project also highlights the value of Sacramento’s remarkable urban forest (2). 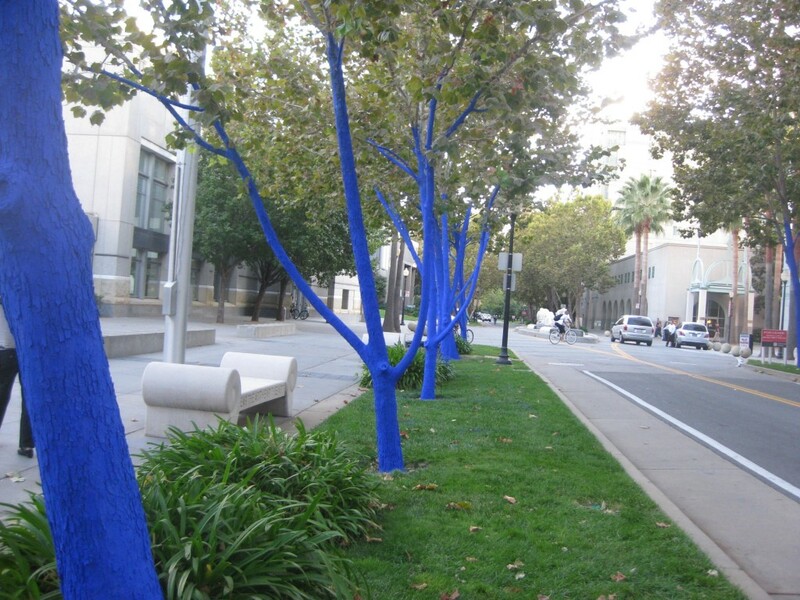 The Sacramento Blue Trees Project includes 20 mature trees along 13th Street between J and K, and 40 container trees that will be placed in different locations around town during and then will be planted at the end of the project (3). 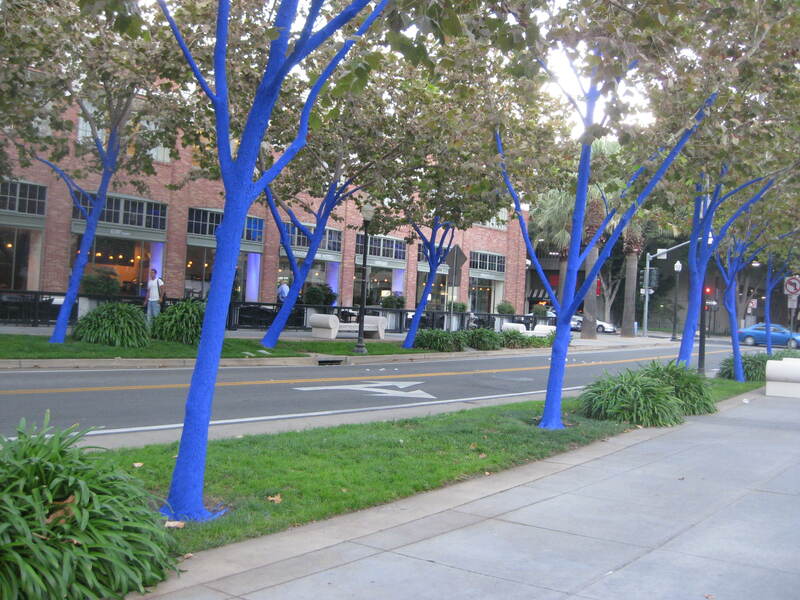 The vibrant blue is created with a water-based, non-toxic, biologically safe pigment. Blue trees do not exist in the natural world, and so, like pink elephants, Dimopoulos creates a surreal environment that startles our perceptions and delivers an image that we cannot get out of our minds (4). For Dimopoulos, the blue symbolizes a sense of the sacred as well as, paradoxically, a lack of oxygen; for without the trees, we would not have breath. 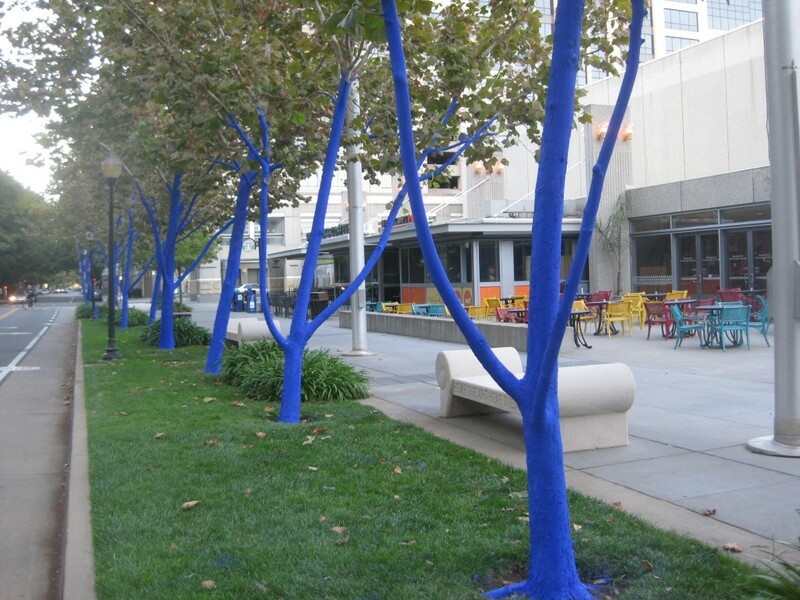 Colossal has some stunning photos of the Blue Trees Projects from other cities. Konstantin Dimopoulos creates social art installations where “human or environmental actions… become visual references” (5). This visual reference creates conversation, and from conversation, change can occur. The “Writings” section of his website includes some inspiring and moving writing about public art. In one particular piece, he describes public art as a physical entity that occupies and alters space. He speaks of nature as the “ultimate creative palate” and that artists are to echo that and make it visible. Sacramento is rich in trees. We enjoy more trees per capita than any other city (except maybe Paris). This urban forest needs tending to be maintained and thrive. Issues such as diversity in tree species and age, planting space, tree size, pruning methods, and disease prevention pose significant risks to our urban forest (6). 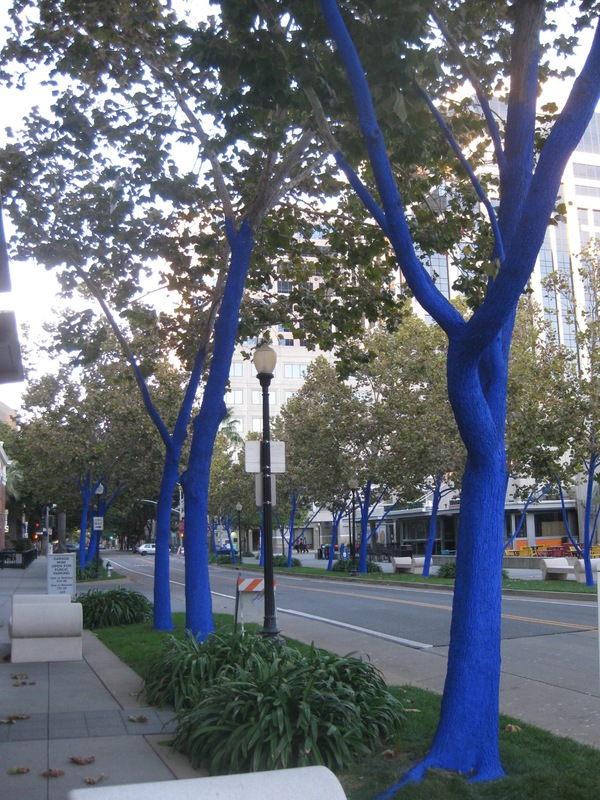 Sacramento Tree Foundation is a local non-profit organization working on many levels to help create the “best regional urban forest in the nation” and they were heavily involved in bringing the Blue Trees to Sacramento. Their many projects range from Free Shade Trees to a Seedling Growing Program to training local Tree Stewards. There are many ways to volunteer with the Tree Foundation and you can become a member to help support their great work.